Gov. Jerry Brown declared a state of fiscal emergency in California on Thursday, a move he made to underscore the need for immediate legislative action to address the state's massive budget deficit. Brown's declaration reaffirms the fiscal emergency declared by his Republican predecessor, Gov. Arnold Schwarzenegger last month. Brown, a Democrat, was elected to succeed Schwarzenegger in 2010 and assumed the post in January. 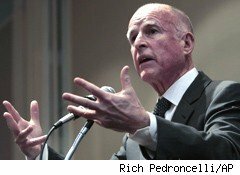 In his proclamation, Brown said that "without corrective action" the combined deficit for this year and the next will be $25.4 billion; that revenues are $3.1 billion lower than were projected; and that Proposition 22, which passed in 2010 and restricts how the state can use local taxes, actually created an additional budget shortfall of $1.6 billion. Revenues for the year, he says, will "decline substantially," whereas expenditure will "increase substantially." Last week, Brown presented a budget that slashes spending by $12.5 billion, including pay cuts for most state employees, and undertakes a "vast and historic" restructuring of government operations. The revenue side of the budget includes extending measures that will have to be first approved by voters. The budget also assumes action on the part of lawmakers by March, including calling for a ballot on the extensions in June. When Schwarzenegger wanted to act on the budget recently, Democrats in the legislature declined, according to Reuters, preferring to wait and work on it with Brown. Now, Brown needs just a handful of Republican votes to put his measure in front of the voters -- votes that GOP leaders suggest he might not get. But the Democratic leader of the state senate, Darrell Steinberg, is optimistic that the legislature will pass Brown's proposal in time.